Arkansas 2010-13 STIP, which was released in April, lists a FY 2010 letting for the Charles W. Dean Memorial Bridge over Mississippi River for "Phase I". The project has an earmark of $8.67 million and the total letting is anticipated to be $10.35 million. The recent I-69 book estimates total cost of project to be around $500 million. 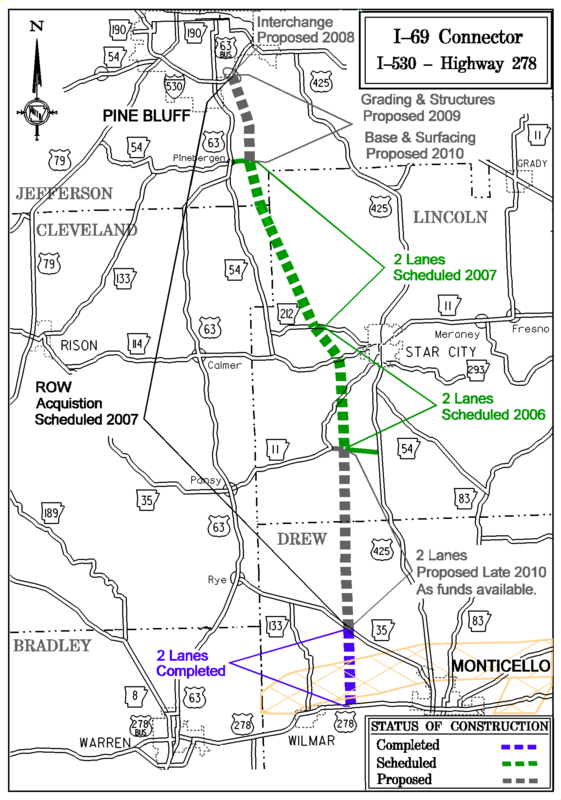 The STIP also lists a FY 2010 letting for "Phase I" of 8.60 miles of a "new terrain" Monticello bypass. That project has an earmark of $70.49 million and the total letting is anticipated to be $88.1 million. Monticello Bypass (Phase I) (F) 069 2010 New Location 8.60 $88,107 $70,486"
Since right-of-way acquisition for the Great River Bridge (is it officially Charles W. Dean Memorial Bridge yet?) is currently ongoing, I thought it was as good a time as any to start an "Arkansas" I-69 thread. Phase 1 for the Great River Bridge involves right of way acquisition, which is already underway. Phase I for the Monticello Bypass is preliminary engineering which involves environmental work. I don’t believe either project is going to make FY 2010. It will be interesting, and possibly time-consuming, to see if AHTD keeps pushing the dates back in order to wait for results of the seven-state I-69 alternative financing study, for which the consultant has not even been chosen yet. Received an e-mail from AHTD today. 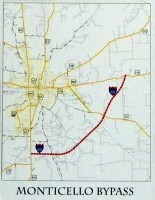 Monticello Bypass project is now scheduled for a September 2011 letting. I believe this will be the first engineering/ construction work on a future segment of I-69 in Arkansas. Will be interesting to see how Arkansas manages maintenance of existing road network, I-49 & I-69. Not to mention also the US 67 upgrade to a freeway up to Walnut Ridge, AR. 67 won't be part of I-69. I'm just saying that's another big project that AHTD has to manage and fund, along with I-49 and I-69. It has taken a long time to do it, though. 67 really should have been finished years ago, but AHTD seems to worry too much about paving over someone's farm. I have tried all search parameters I can think of to find this, and I'm not having any luck ...what is the route I-69 will take through AR? Is it still proposed, or is it final? 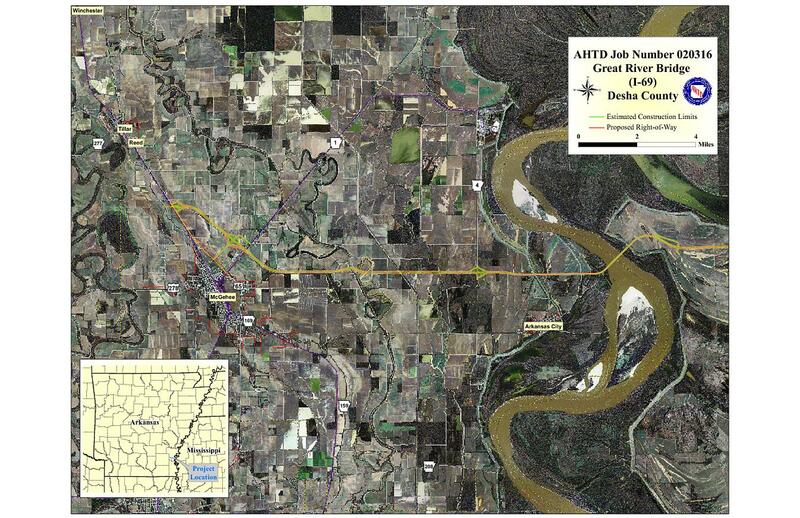 I recently took a look at the SIU 14 (El Dorado AR to Haughton LA) website (http://www.i69arkla.com) and noticed this map (http://www.i69arkla.com/images/RevisedPreferredAlternative(1454%20x%202046).jpg) on the home page that is fairly detailed. It may be one of the maps on the link NE2 provided, but I am not sure. As best as I can tell, they appear to be in the Preferred Alignment Revisions Review phase, which immediately precedes the issuance of a FEIS and ROD. I have no idea what the timetable may be to get to a ROD. Work on the Monticello Bypass is scheduled to be let in September. I cannot find an active link that has the SIU 12 FEIS. Any suggestions? SIU 12 is the approximate 20 mile link from McGehee to Eutaw Landing MS crossing the Mississippi River and both a FEIS and ROD have been issued ... I cannot find an active link that has the SIU 12 FEIS. 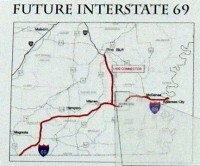 what is the route I-69 will take through AR? Is it still proposed, or is it final? The only “I-69” project currently scheduled is the grading and structures phase of the Monticello Bypass – from Highway 425 to Highway 278 East. The next job would be for the base and surfacing of this project. ... Also Wednesday, Southern Industrial Contractors LLC of Rayville, La., was the apparent low bidder on a $13.1 million project to build a bypass around Monticello in Drew County. The 8.5-mile project, which includes construction of a bridge over the Union Pacific Railroad, will stretch from U.S. 278 East to U.S. 425 South. Martin Marietta Materials Inc. of Hot Springs was apparent low bidder on a $13.9 million project to pave a new road from I-530 to Arkansas 35. 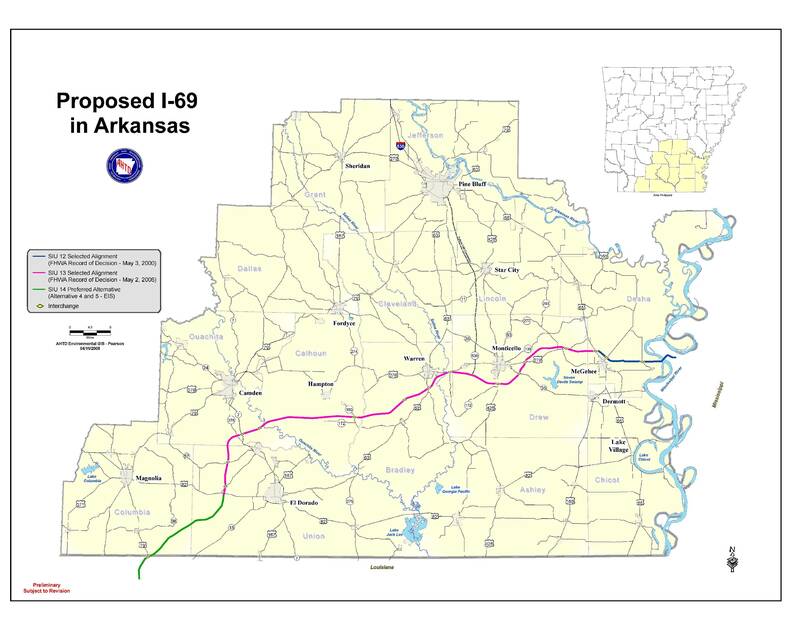 The project, known as the Interstate 69 connector road, Bolick said, eventually will connect I-530 to Arkansas 212 near Star City. Portions of that project are already under way, he said ..."
The latest project let was for base and surfacing of the stretch from the new I-530 Bypass interchange south to near Pinebergen. A contract for the base and surfacing is already underway from Pinebergen south to Highway 212 near Star City. When those two projects are completed - about two years probably – we will be able to open it from Pine Bluff to Star City. South of Highway 212 work is in different stages, but will still need base and surfacing contracts. The piece – I think it is five miles long – from Highway 35 south to Highway 278 has been opened for several years. It is interesting that work along the Connector has progressed more rapidly than work on I-69 itself. Was not aware so much was underway. A look at the Bing aerials reveals the road work, including a good amount of work complete at the Interstate 530 interchange. I've not been down that way in a while. Guess I should wait until November so I can drive it and get some photos. I think it will be confusing, though, to have AR 530 branch off I-530 unless the new road becomes I-530 and the other section reverts to US 65. I emailed Glenn Bolick at AHTD again and asked him if (a) the Connector was being built to interstate standards, and (b) if so, would the section from Star City up to the I-530 interchange be immediately signed as I-530 since it would be connected to the currently existing I-530. The connector section is being built to Interstate standards – but it is only being built as a two-lane roadway. The right of way is already acquired, but we will not add the additional two lanes until a later date – more along the lines of when it connects to I-69 and then it would most likely become I-530. The south end of the connector is signed “Highway” 530 and that’s what it will be all the way to Pine Bluff. It looks like drivers in the Pine Bluff area will have to deal with some confusion for a good while. The ground breaking for the first official I-69 project in Arkansas is scheduled for Wednesday, November 9 at 11:00 am in Monticello. The event will be in middle of the project corridor where it crosses Highway 35 southeast of Monticello. From Highway 278 east, take Highway 35 south for about three miles. The agenda is expected to include comments from AHTD Director Scott Bennett, AR Highway Commission Chairman Madison Murphy and Congressman Mike Ross. Dozens of state, regional and local officials gathered in Drew County on today to break ground for the first construction project for Interstate 69 in Arkansas. The $13 million project, which will stretch 8.5 miles from U.S. 278 East to U.S. 425 South, is a tiny portion of a what will be a 2,700-mile highway from Canada to the Mexican border. Small sections are already open in Mississippi, Tennessee, Kentucky, Indiana and Michigan but nothing is connected yet. The entire corridor from border to border will cost about $30 billion. Arkansas’ 185-mile portion is projected to cost about $3.6 billion. “Once completed, I-69 will be a national freight corridor linking manufacturing and agriculture centers throughout the country,” said U.S. Rep. Mike Ross, D-Prescott. Construction of I-69 is expected to create thousands of jobs and provide billions of dollars in wages over the next two decades, according to the congressman. The I-69 route from Canada to Mexico is one of six “Corridors of the Future” designated by federal highway officials in 1993. “That is a huge designation for future federal funding that will potentially help us in our funding endeavors,” said Arkansas Highway Commission chairman Madison Murphy, one of two state highway commissioners attending the ceremony today. Scott Bennett, director of the state Highway and Transportation Department, said awarding the construction contract and Wednesday’s groundbreaking is evidence that work is ongoing in the I-69 project in Arkansas. “I know a lot of you think we’ve just been sitting here not doing anything with I-69, but I think this is evidence that there’s been a lot of work going on,” Bennett said. Ross, who announced in July that he would not seek another term, said breaking ground on the first I-69 project in Arkansas during his term is one of his proudest accomplishments. “As I reflect back on what will have been 12 years in the U.S. House of Representatives and 10 years before that serving with Mike Beebe in the state Senate, I can tell you that among my proudest accomplishments is the fact that we’re able to break ground on I69 in Arkansas during my time in Congress,” Ross said. As recently posted on "I-69 in LA..." thread, a ROD has not yet been issued for SIU 14. I've communicated with a local FHWA official and it appears that the major holdup/problem is that neither Louisiana nor Arkansas has any funds allocated for I-69 SIU 14 in their respectives STIPs. If a ROD were to sit dormant for a certain length of time, a re-evaluation would have to occur before any construction could begin. The various governmental entities are currently trying to figure out the best way to handle this situation. In the FEIS, Arkansas projects a twenty-five year implementation schedule from 2015 to 2040, which projects a beginning four years before Louisiana's projected start date of 2019 (pages 5-7 and 5-8 of FEIS; pages 207-208/760 of pdf). It will be interesting to see if Arkansas will be willing to commit to some funding in its next STIP. Speaking of Bing Maps. Looked at I-49 south of Doddridge. Seems to be coming along very nicely. The latest project let was for base and surfacing of the stretch from the new I-530 Bypass interchange south to near Pinebergen. A contract for the base and surfacing is already underway from Pinebergen south to Highway 212 near Star City. When those two projects are completed - about two years probably – we will be able to open it from Pine Bluff to Star City. The south end of the connector is signed “Highway” 530 and that’s what it will be all the way to Pine Bluff. THE PURPOSE OF THIS PROJECT IS TO CONSTRUCT EMBANKMENTS AT THE SOUTHERN END OF THE PROJECT AND PAVE 7.752 MILES OF ROUTE 530 AND CONSTRUCT HWYS.11/425 CONNECTOR IN LINCOLN COUNTY. THIS PROJECT CONSISTS OF EARTHWORK, AGGREGATE BASE COURSE, ACHM BASE, BINDER AND SURFACE COURSES, ONE CONTINUOUS COMPOSITE PLATE GIRDER BRIDGE (TOTAL LENGTH 235.26'), A DOUBLE 11' X 6' X 93' R.C. BOX CULVERT (SPAN 27.91'), MINOR DRAINAGE STRUCTURES, SUBGRADE PREPARATION, RESHAPE SLOPES, EROSION CONTROL ITEMS AND MISC. ITEMS. Here are the plans for the project. This is great news for Southeast Arkansas that they will finally have Interstate access (even if not right away) to other parts of the state/nation. I would love to see I-530 extended to Monroe or even be a part of the future of Gulfport-Hattiesburg-Jackson freeway. I-49 in MO/I-40 in AR/I-530 towards the south or east would open up a new corridor to take pressure off of other routes, not to mention tie into I-69. Frankly, I'm not keen on the L-shaped I-69 routing in AR/MS. I don't think it will take mileage off of transcontinental traffic. I thought it needed to be much more diagonal from Memphis to Shreveport to really blaze a new path. Future I-530 to Monticello pleases me more than the AR segment of I-69 in all honesty.